Nu-Heat’s UFH training days are useful for all types of installer, regardless of your level of experience, giving you the chance to take a closer look at key components and pick up some practical installation tips. The training centre is kitted out with the most popular UFH systems, including Screed, Floating, the LoPro® range and ClippaPlate®. You can ask as many technical questions as you like! The course is run by James, our Design Manager, who has over 10 years’ of UFH experience. If you have any questions about how a system works, or how it is installed, he can help. We’ll talk you through specifying the right type of UFH system in the early stages of a project. 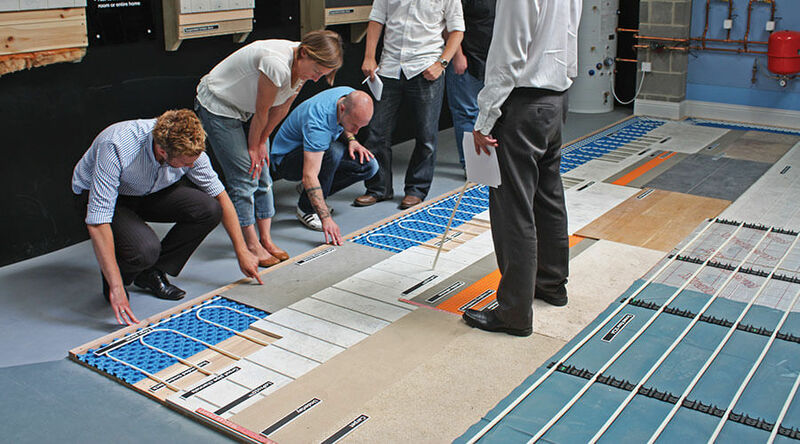 You can try out LoPro®10, a retrofit system, and ClippaPlate, a joisted floor solution, in our test installation bays. One of the most common questions we hear from homeowners is “what floor covering can I have if I go for UFH?” James will talk you through the range of compatible floor coverings and any considerations for more sensitive finishes. Find out how our detailed design process works and how the bespoke outputs, such as the detailed mechanical and electrical drawings, help with a smooth installation. The training centre includes working examples of key system components to show how a UFH works, as well as a finished LoPro®Max installation. Nu-Heat offers a range of thermostat choices. We’ll talk you through the most suitable thermostats for different projects and explain how the neoStats can be simply upgraded to include smart control from a smartphone or tablet. An hour of the day is spent with Peter, a Development Support Engineer and qualified electrician, so you can get an understanding of how an UFH system should be wired. Your Account Manager will always try to pop into the training day to meet you, putting a face to the name. You can find out more about the course content and book a place through the Nu-Heat Webstore or by calling us on 01404 549770.